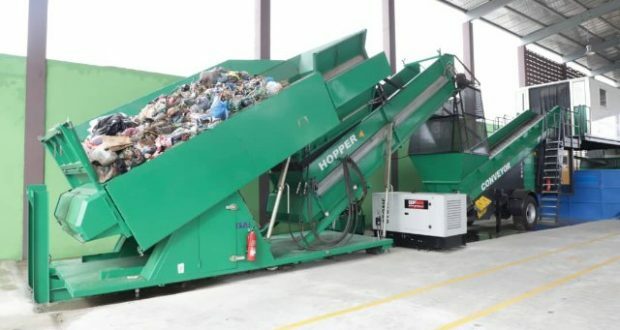 Regional Ministers who recently paid a working visit to the site of Hi-tech Integrated Recycling and Compost Plant (iReCop) in Accra, have called for the installation of similar plant in their respective regions. This they argue, will help resolve the challenges they have been facing in dealing with waste in their regions as well as create jobs for the teeming unemployed youth. The facility, commissioned last week, is situated at the Accra Waste Recovery park, an industrial hub for the recovery of waste materials into reusable products, has a high material recovery rate of up to 90% of the mixed waste. It has the capacity to process 200 metric tonnes of waste a day and nearly 100 metric tons of compost daily, to support the agricultural and horticultural ventures. At the commissioning ceremony of the facility last week, Executive Chairman of the Jospong Group of Companies, Joseph Siaw Agyepong, hinted of plans to install the recycling plant in all 16 regions as part of efforts to support government’s industrialisation agenda to create jobs for the youth. The Plant Manager, Emmanuel Oteng, explained that the plant is built on a robust technology and can produce 100 metric tons of organic compost per day to displace over 864,000 bags of chemical fertilizers imported into Ghana annually to boost the Ghanaian economy. He said the socio-economic and job creation benefits of the facility are enormous as each plant will provide direct and indirect employment for over 1,000 youth in the regions. The Greater Accra Regional Minister, Ishmael Ashittey, who led the delegation to the facility, described the commissioning of the facility as timely intervention to create jobs and sustainably manage waste. He said, the plant which had begun massive waste recovery and recycling since it was commissioned few days ago, was busily receiving waste from various tricycle operators within Agbogbloshie and its environs.